Taha comes from a background in international development working on various projects in West Africa since 2009. 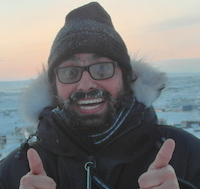 He moved to Iqaluit in 2013, working with the Government of Nunavut’s Department of Health in the Health Promotion division and is now based at the Qaujigiartiit Health Research Centre in Iqaluit. Taha has a passion for social justice and youth engagement, and he can grow a formidable beard.